Usually I have chair lust, but today I have bench lust. 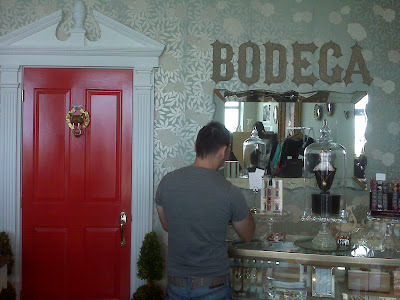 While strolling the boardwalk in Asbury Park this weekend I visited Bodega. Charming in every way, this little shop is a mix of homegoods, vintage books, trinkets, stationary and everything else in between. 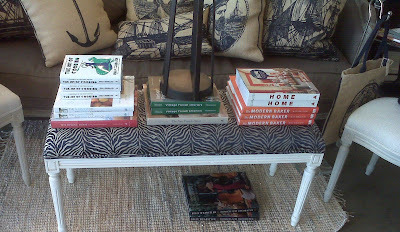 I couldn't take my eyes off of this coffee table-as-bench. I love the glossy white legs and the dark colored animal print. An ottoman as coffee table we've seen done often, but I love the idea of this leggy bench instead. A stack of books makes a place to perch your wine glass, and when you need the space, just swoop the books away and you have more seating. The online shop opens this spring, I will definitely be back to check out the goods. I was able to snap one pic as I was walking out of the store of the owner doing a little product merchandising. That wallpaper, that door...I love it. 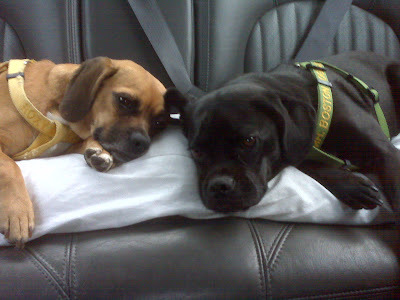 One beach weekend + a long walk on the boardwalk = two tired puppies on the way home. Those little puppies sure do look pooped! 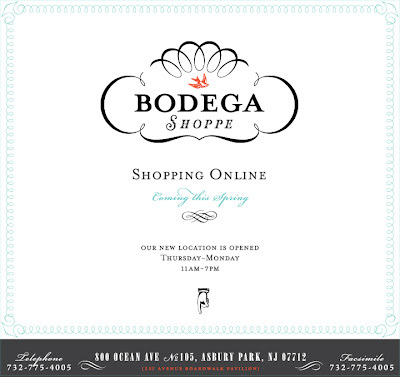 Bodega looks fantastic! I love your photos, and I love the bench too! That looks like an impossibly stylish and fun store. Thanks for sharing! I love the two puppies. Although to me they don't look like puppies. They look like full grow dogs.